Lucy Letherland is an illustrator based in London. She graduated from Manchester School of Art in 2011 with a First Class BA (Hons) in Illustration with Animation. 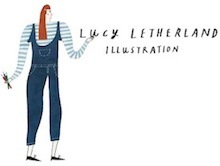 Lucy’s work is strongly led by humour and narrative, creating a playful graphic quality. She uses a mix of hand-drawn and digital techniques to produce lively illustrations filled with detail.